already truly, entirely, wildly, messily, marvelously who we were born to be. Like many of us, I have been known to read Oprah Magazine. Probably like many of us, I might read an article or two in a doctor’s office waiting room, and promptly forget the article’s contents as soon as I put down the magazine. When I first read this particular passage by author Anne Lamott, however, I got to thinking about the paradox she presents. For long after my time at the waiting room, I asked myself: How is it that we find ourselves only when we start to notice that we are already found? How is it that we are, at the same time, already exactly where we are meant to be and yet still evolving? How is it that change happens when we accept that we are already—perfectly—who we are, and yet also on our way towards becoming someone new? My own response to these questions echoes Anne Lamott’s: accepting ourselves as who we already are allows us permission to access who we are not yet but still hope to become. It is precisely when we accept where we already are that change can occur. For me, this is a critical piece of the therapy process. Many of us might come to therapy hoping to become someone different, looking to shed a familiar burden of pain, or seeking to become free from a place we’ve been stuck for so long. Perhaps the place that we are starting from is the absolute last fact about ourselves that we would ever want to accept; perhaps the reason we come to therapy is the thing about ourselves that we most wish we could push away. I was neurotic for years. I was anxious and depressed and selfish. Everyone kept telling me to change. I resented them and I agreed with them, and I wanted to change, but simply couldn’t, no matter how hard I tried. Then one day someone said to me, Don’t change. I love you just as you are. Those words were music to my ears: Don’t change, Don’t change. Don’t change. . .I relaxed. I came alive. And suddenly, I changed! However profound his transformation, it is my guess that DeMello’s experience of acceptance and change wasn’t as sudden as his story might suggest. For most of us, this process might be messy, scary, long, uncomfortable, or even (temporarily) painful. But the promise of change makes this journey possible. We have to bravely face the already in order to get to the not yet! Mental health professionals and spiritual leaders alike suggest the tool of mindfulness as the first step towards acceptance. One example of a therapeutic modality that asserts this paradox between acceptance and change, and responds with mindfulness, is Dialectical Behavior Therapy (DBT). DBT begins with the assumption that two seemingly opposite things can both be true (in fact, this is the root of the word dialectic). 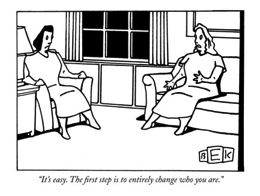 DBT’s central dialectic, then, is that people can both desire acceptance as they are and, at the same time, desire change. Anne Lamott, Anthony DeMello, and many of us might find DBT’s basic assumptions to be familiar. Some snapshots from my practice might further illustrate this paradox. The 60-year old man, recently diagnosed with Early Stage Alzheimer’s disease, learns how to live with his memory loss by making changes to his daily routine. Accepting his disease allowed him to make the accommodations that transformed his life. An 11-year old girl mourning the loss of her best friend, greets her grief with curiosity and acceptance, and over time learns to live in joy instead of fear (not to mention winning the school spelling bee). A 36-year old woman accepts that her relationship is not where she wants it to be, and gives herself permission to make the necessary changes. In each of these snapshots, it is precisely when these folks notice where they are – scared for the future, grieving a loss, or unhappy in relationship – that their transformation can begin. Mindfulness, then, can bring us to acceptance of ourselves as we already are: truly, entirely, wildly, messily, marvelously ourselves. Here she asserts that we do not have to do or be anything different than we already are. Later in the poem, even all of nature affirms that we belong – just as we are, already. Anthony DeMello, Song of the Bird (1982). New York: Doubleday. Jon Kabat-Zinn, Wherever You Go, There You Are (1994). New York: Hyperion. by Lisa Anyan Smith, Ph.D. The cynical version of this quote illustrates (however crudely) the difficulty that many of us have with letting go. Letting go of unhealthy relationships, of anger, of jealousy, of addictions, of coping mechanisms that no longer serve us well, can be difficult to accomplish. Why is it so difficult for some of us to “just let it go”? What can we do to ease the process of letting go? Letting go can be a challenge because we, as human beings, are creatures of habit. There is some comfort in the familiar. Shedding old, destructive patterns or behaviors can leave us feeling as vulnerable as a small child throwing away a tattered and filthy blanket. Although logically we may reason that we are better off without it, emotionally we can be left feeling bare. Yet letting go is a process that we all must face at one time or another. We must let go of the old in order to invite in the new. Like the child who must say goodbye to the beloved blanket, we must bid farewell to what is holding us back developmentally. Letting go is growth. Letting go is akin to rock climbing, in which you must let go of a toehold in order to reach the next height. Reaching, striving – we must let go in order to find our next step. Yes, you say, I understand that I must let go. But how? 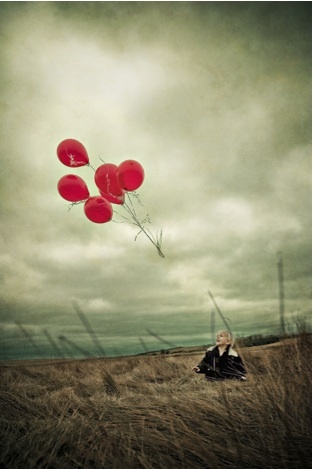 The following steps can assist you on your journey toward letting go. We all possess a dark side, the part of us that we often prefer to remain hidden from the world. Karl Jung referred to that portion of us that we fail to see or know as the “shadow.” That which we refuse to examine does not disappear; on the contrary it takes on a greater power until it erupts in a harmful way. For example, repressed anger can result in displaced aggression. Robert Johnson, in Owning Your Own Shadow, posits that “to refuse the dark side of one’s nature is to store up or accumulate the darkness; this is later expressed as a black mood, psychosomatic illness, or unconsciously inspired accidents” (p. 26). Through self-examination we can cultivate awareness of the shadow, and through ritual or creativity we can discharge the shadow energy in a healthy manner. Awareness of the grip that we have on unwelcome thoughts, feelings, or relationships – and the grip that they have on us – is crucial to the process of learning to let them go. For example, we all experience anger at some time or another. Holding on to anger can negatively impact our general sense of happiness, relationships with others, and physical health. Thich Nhat Hanh, a Buddhist monk, likens anger to a howling baby, suffering and crying. He encourages us to be mindful of the anger, to cradle and embrace the baby. Once we have accepted the anger and acknowledged it as our own, we can work with it. We can realize compassion for the target of our anger and feel better. Taoism is a manner of living in harmony with Tao, the Way of the Universe. Lao-tzu, author of the Tao Te Ching, urges us to see the value in being humble. If action seems called for, he asks us to consider nonaction. If we feel that grasping will help us acquire what we need or want, he counsels us to let go and be patient. A cornerstone of many successful 12-step programs, such as Alcoholics Anonymous, involves letting go of control. The Serenity Prayer urges those seeking relief to be granted “…the serenity to accept the things I cannot change, the courage to change the things I can, and the wisdom to know the difference.” This idea can also be expressed in the notion of surrendering to win. A friend of mine likens letting go to dropping the rope in a tug-of-war contest. When competitors on both sides are pulling equally on the rope, a stalemate ensues. When one side drops the rope, movement occurs immediately. While the side that drops the rope may not “win,” the action still leads to change. It has been said that time heals all wounds. Trust that letting go will occur if you open yourself to that possibility. Look outside of yourself. Move outside of your comfort zone. Volunteering to help others in your community will aid in moving forward. Do something different! Taking a class at the local community college, learning a new language, or starting a new hobby will focus your attention on the present and assist in letting go of the past. Borysenko, Joan, Inner Peace for Busy Women: Balancing Work, Family, and Your Inner Life (Carlsbad, CA: Hay House, 2003). Hoff, Benjamin, The Tao of Pooh (New York: Penguin Books Ltd., 1983). Johnson, Robert, Owning Your Own Shadow: Understanding the Dark Side of the Psyche (New York: Harper Collins, 1991). Kubler-Ross, Elisabeth, On Death and Dying (London: Routledge, 1969). Lao-tzu, Tao Te Ching (translation by Stephen Mitchell) New York: Harper & Row, 1988). Thich Nhat Hahn, Anger: Wisdom for Cooling the Flames (New York: Penguin Books Ltd., 2001). by Molly Keeton Parnell, Ph.D. This is what my yoga instructor stated last week as we were moving into Savasana, or the meditation portion of the class. This observation gave me pause for a moment and then quickly resonated as true. I was immediately aware of how much more time my mind spends actively thinking compared to the miniscule amount of time that I spend just “being” in my body and with my breath. For a moment, I was absolutely captivated by the fact that while we are equally mind, body and breath, the mind takes about 99.9% of the airtime. I suddenly had the image of a horse drawn carriage with the coach using a whip to keep the horse going. The mind is like that coach, whipping the attention back to itself over and over and over again. If the mind even begins to wander towards a moment of quiet, there’s that crack of the whip and we are again deeply entrenched in thought. On the contrary, for most of us the body only demands attention in the case of physical discomfort (and even then, the mind never stops going full speed. It may just share some of the real estate with awareness of body). And it seems that the breath almost never dominates our attention, unless there is some respiratory illness or perhaps a panic attack, where the ability to breathe is perceived to be diminished. In fact, a panic attack is a good example of the connection between mind, body, and breath because of how quickly the mind jumps in to perpetuate the sense of panic. Shortness of breath may be a cause of concern, but it only turns into a full blown anxiety attack when the mind starts putting negative labels on the feelings in the body, which causes an intensifying of bodily sensations that lead to more panicked feelings in the mind, and so forth. Just thoughts of not having enough breath leads to what feels like a physical reality of not having enough breath. And yes, I had all of these thoughts while I was SUPPOSED to be headed into a meditative state. The irony was not lost on me. I redirected my focus to my breath, yet my mind continued to think about the way it was thinking, about the way that humans seem to be programmed, about my grocery list and messy house, and how well this thinking vs. being struggle would fit into the article that I needed to write. Sensing that my restless and hyper brain was not easily inclined to getting quiet, I opted to give way to trying to force it to happen and instead to simply notice the way that my mind seems to work. I was immediately aware of the desire to let go of thinking and the sense of panic that my mind felt at that notion – the fear of letting go. I then felt frustration that this seems to be such a difficult task, wondering if it is only difficult for me and why I haven’t mastered it at this point in my life and emotional growth. As I started to berate myself for this, I noticed what my mind had done. By beating myself up for my lack of meditation skill I was remaining active in my mind. My mind had tricked me into staying mentally focused by distracting me with the oldest trick in the book – self-criticism. While I did not have the breath-body experience that I wished for, I learned something significant about the various ways the mind manages to stay primary and also found inspiration for this article! So, what is it that compels us to think, think, think? To think about thinking? To think about how to not think (now, there’s a no-win puzzle for you!)? What is responsible for the non-stop dialogue of the brain, the million thoughts a minute diatribe wherein I can go rapid-fire from thoughts of my to do list, to pondering my spirituality, to worrying about getting my article written quickly, to beating myself up for my habit of procrastinating, to wondering what purpose procrastination serves for me and if I’ll ever find a better way, to reflecting that perhaps I could practice self-acceptance related to procrastination and simply accept it as a part of life? It turns out that the source of the 24-7-365, not-a-millisecond-off running monologue is the left hemisphere of the brain. You may have heard that left brain dominant people are better at math and right brain people are the artists of the world. And perhaps it is true that people are generally more dominant in one side than the other, but the reality is we all have two hemispheres that work together as a whole yet have dramatically different purposes and functions. In cases where the two halves of the brain have been surgically separated (by cutting the corpus callosum, or the structure that connects the two sides) the right and left hemispheres have been found to operate as two separate brains, each with distinct personalities. In humans with a normally functioning corpus callosum, the two hemispheres of the brain are “more appropriately viewed as two complementary halves of a whole” and “virtually every cognitive behavior we exhibit involves activity in both hemispheres – they simply do it differently” (Bolte Taylor, p. 29). However, scientists still do not fully understand the way the two halves work together. While it was long believed that the corpus callosum created communication between the two hemispheres, recent research supports the idea that the corpus callosum may actually be serving to keep the two halves divided. My experience in yoga class can be well understood by knowing the dominance of the left hemisphere and its instinct to remain in the driver’s seat of the mind. The job of the left brain is to sort, organize, and analyze all incoming information. When stimuli is received through our senses (eyes, ears, etc. ), the left brain categorizes and notes distinctions, or where things are different. For example, it is your left brain that is interested in better understanding the differences between your two hemispheres. (Your right brain is in the moment, feeling peaceful, and doesn’t really care what part does what)! The left brain is “linear and methodical” (Bolte Taylor, p. 31) and sees the details rather than the whole. The left brain manages our interactions with the world by time streaming every piece of data. It both sorts things according to the proper sequence (i.e. we put on our socks before our shoes) and organizes events in their proper place in time (i.e. past, present, and future). The mechanism by which the left brain completes its duty of sorting, organizing and analyzing is through language. The left brain contains our language centers, which utilize words to define and categorize, or break the big picture down into data bits that are distinct and manageable. For example, Bolte Taylor points out that when out in nature, our left brain sees and labels the distinct parts of all that we see, such as stem, petal, and leaf. The left hemisphere then organizes those details back into the whole to see a flower. It “… thrives on weaving facts and details into a story” (Bolte Taylor, p. 31). It uses deductive reasoning and creates an understanding of the world in this way (i.e. if A is greater than B and B is greater than C, then A must be greater than C). The left mind’s language centers help us to understand that letters form words and that words form sentences. It is the left hemisphere that comprehends the meanings of these words and sentences, but it can only do so in a literal way. If I say that my friend is really cool, the left brain might want to give her a blanket, whereas the right brain understands the more subtle interpretation of this phrase. We need our right hemisphere to help translate things like humor or sarcasm as well as for interpreting non-verbal communication. Our left brains also think in ways that become patterned based on incoming sensory information. Neurological circuits are developed and then run mostly automatically. These circuits allow us to take in information efficiently without having to break what we are sensing down into the individual pieces and then reconstruct those pieces into a whole. So, when I see an object that can be easily held in the hand that contains buttons with numbers, I know it is a telephone even though there is wide variation in the way different phones look. Each time one of these neurological circuits is stimulated, it becomes more engrained and then takes less outside stimulation to run in the future. Our left hemisphere then becomes quite adept at prediction, not only predicting how objects may function (a phone will ring) but also how we will feel, react, or respond to things based on the past. Thus, our left brain may give us a story such as “I always turn in my assignments late”, which then gets replayed and strengthened every time the topic of an assignment floats through the mind. In receiving all sensory stimuli as distinct parts, the left hemisphere also focuses on the separation between ourselves and others. This half of the brain contains the “ego center”, which defines the self as “I” and defines what we do, think, and feel as “I am”. Our constant brain chatter helps us to rehearse and memorize the details of our lives, such as our names, occupations, relationship status, values, preferences, etc. As it is the job of the left hemisphere to categorize, all data is sorted into dichotomous classes such as “good”, “bad”, “like”, or “dislike”. The left hemisphere similarly engages in constant comparison between ourselves and others, using a comparable hierarchy for “better”, “worse”, “success”, “failure”, etc. While the right brain sees connection and wholeness and holds the intuitive knowledge that we are perfect just the way we are, the “… ego mind revels in our individuality, honors our uniqueness, and strives for independence” (Bolte Taylor, p. 33). Guess who wins when it comes to our self-concept? You got it – the left hemisphere. This is the courtroom of life. And you are the one who is on trial… The judge is a part of your mind… it also lives through your body and your energy. The judge is a master of words, and yet you can feel it in your belly, your shoulders, and your jaw without any awareness of words. The judge is both pervasive and invisible. It speaks to you from commercials on TV, magazine ads and movies, as well as from the expression on your partner’s face, the dirty dishes in the sink, and the tone in your supervisor’s voice (Brown, p. 14). The inner critic is the part of the mind that continuously and constantly evaluates, compares, judges, criticizes, blames and attacks us and others. The inner critic is always on call to condemn any of our innermost thoughts, beliefs, feelings or desires or which it disapproves. Nothing gets by the critic. It is rigid and perfectionistic, so most of our feelings, beliefs, and thoughts do not escape its judgment. The inner critic is always present but also invisible. It presents its point of view as fact rather than opinion. The inner critic uses every piece of information ever taken in (from your caretakers, cultural group, school system, church, etc.) about how one is supposed to operate in the world. It is guided by the harsh and punishing attitudes of the environment in which we live. It compares you to yourself – your past self, your future self, the self you should be. It compares you to others, others to you, and others to others. The inner critic excels in the ego center of the left hemisphere of the brain. The ego exists based on the concept of “I”. When we use the word “I”, we are generally referring to where we live, what we do for a living, what our relationship status is, what our hobbies include, etc. So, I might say I am a psychologist. I am a sister. I am American. I love movies. I might say that I am introverted, I am compassionate, I am a procrastinator. These things are part of my life circumstance, value system, and personality, but are they me? Are we able to say who we are without going down the list of where we came from, what we do, and what we believe ourselves to be? According to Brown there is a way to quiet the inner critic. To begin the process of “disengaging from self-judgment…” you must begin “knowing yourself as a living soul” (Brown, p. XVII). Perhaps the best way to do this is to learn more about the right side of the brain. While our left brains maintain dominance throughout most of our lives, it may actually be our right hemispheres that are primary. We come into this world right hemisphere dominant and remain that way until we are about two years old. Furthermore, for all humans at all stages of life, sensory information goes first to the limbic system (the emotional center of the brain), next to the right hemisphere and lastly to the left hemisphere. Information from the heart and the gut (both of which contain neurotransmitters) also goes to the right hemisphere of the brain before the left. This flow of data seems to prove that “… although many of us may think of ourselves as thinking creatures that feel, biologically we are feeling creatures that think” (Bolte Taylor, p. 19). The right hemisphere functions like a parallel processor that takes in multiple sources of information simultaneously, comprehending at once the “big picture”. The right side contains our emotional sense of self and is responsible for relationships and emotional attachments. The right hemisphere sees the implicit meanings in things and is the part that responds to poetry, metaphor, and humor. It interprets non-verbal communication, such as tone and facial expression. The right hemisphere does not speak in words but rather in images, symbols, pictures and metaphors. If you have ever had an “A ha” moment where a light bulb of understanding suddenly illuminates, that occurs in the right hemisphere. Our right hemispheres see the connections between things rather than the boundaries that separate. It sees how parts make up a whole. We have our right hemisphere to thank for the gift of empathy, or the ability to place ourselves in the position of another and imagine what their experience might be. It is our right mind that gives us the ability to remember with crystal clarity certain isolated moments that have significance in our emotional lives (i.e. the first time you exchanged the words “I love you” with your partner or where you were when you heard about the September 11th attacks). The right mind takes in information in relation to other pieces of information and “… Borders between specific entities are softened, and complex mental collages can be recalled in their entirety as combinations of images, kinesthetics, and physiology” (Bolte Taylor, p. 30). …deep internal peace is accessible to anyone at any time. I believe the experience of Nirvana exists in the consciousness of our right hemisphere, and that at any moment, we can choose to hook into that part of the brain (p. 111). Bolte Taylor learned that in her pre-stroke life, her personality had been dominated by the left side of the brain and by the tendency to judge and analyze. The experience of the stroke taught her that the two sides of the brain not only function in different ways with different types of perception and thought but also contain different types of interpretations for what is perceived. In short, Taylor’s experience revealed that the two hemispheres have quite different value systems and personalities. She found that the right hemisphere is “…completely committed to the expression of peace, love, joy, and compassion in the world” (Bolte Taylor, p. 133) and that “…peace is only a thought away, and all we have to do to access it is silence the voice of our dominating left mind” (Bolte Taylor, p. 111). However, “left brain is dominant, speedy, and prone to rush in with words and symbols and prefers not to relinquish tasks to its mute partner unless it really dislikes the job or is unable to do it” (Edwards, Courtesy of Courtney Armstrong). How to silence the left mind is a question that Bolte Taylor does not answer. Is it possible to completely silence the inner critic and live completely in each moment? Is this the goal or should we simply strive for a better balance between the two halves? These are not questions that I can answer for you, but I can invite you to take better notice of the inner critic and when its voice begins to take over. Without awareness of the way our brains are structured, the judging part remains invisible, which makes it very, very powerful. It brings to mind one of my favorite movie quotes from the movie The Usual Suspects. It goes something like this…. “What is the smartest move the Devil ever made? To make man think he didn’t exist”. I am not trying to make a religious point here but simply articulate that a force is far more powerful when we don’t even fully understand that it is present. Various forms of oppression have been weakened greatly and social systems changed just through consciousness raising, or helping those being oppressed to understand the larger system of power. When something is unseen, how can it be challenged and overcome? Just simply recognizing that the inner critic is a part of the brain rather than some omnipotent messenger of truth does a great deal to lessen its hold. Brown points out that while we are in the habit of defining ourselves as the “I” – the one who was born in Atlanta, is bad about procrastinating, works as a psychologist and can’t figure out how to keep a clean house – who we really are is a soul. Our right brain seems to be more in contact with that soul and to recognize that as a soul we cannot be compared to any other soul and deemed better or worse. On a soul level we have worth and value that must be separated from the specific details of our lives. We must fully take in that the “uniqueness of the soul is inherent in who you are at birth; it is not achieved, not can it be destroyed, and it is not dependent on your appearance or anything you do” (Brown, p. 31). To learn more about what life could be like with soul awareness, I invite you to watch Jill Bolte Taylor describe her experiences of living in her brain’s right hemisphere. Some of the information in this article came from a presentation by Courtney Armstrong, LPC of Chattanooga, TN. Thank you, Courtney, for helping me to better understand this exciting topic. Bolte Taylor, Jill (2009). My Stroke of Insight. New York: Plume/Penguin. Brown, Byron (1999). Soul Without Shame: A Guide to Liberating Yourself from the Judge Within. Boston: Shambala. Edwards, Betty (1999). Drawing on the Right Side of the Brain. New York: Penguin Books. Let me begin by acknowledging that Gratitude and I got off to a rocky start. As a child, gratitude often meant being reminded how lucky I was to have a loving family, a roof over my head, an education, etc. I was taught to be polite, to say “thank you” for gifts, whether I liked them or not, to express appreciation for whatever was done for me or given to me. I remember one Saturday evening in particular. I was about 11 years old and my mother prepared chicken livers for dinner. As we gathered around the table, I expressed my dislike (perhaps, even contempt) for the main dish, to which my father replied that I should be grateful for this nutritious food and be glad that I was not one of the starving children in (you are free to select an appropriate third world country of the 1950s). After we said Grace, he went on to inform me that I would have plenty of opportunities to learn gratitude for this delicious meal because it would be served every Saturday night from then on. Fortunately (and for this I was truly grateful), his threat was short-lived and it was only a few weeks before we returned to more appetizing meals like meatloaf. Not surprisingly, I never did develop a liking for chicken livers, despite my parents’ best efforts. What I do have now, some 50 years later, is a deep and loving appreciation for the childhood meals we shared in our family kitchen, my mother’s commitment to providing us wonderful home-cooked meals, and my parents’ desire that I learn to value what was given to me, even if I didn’t always like it. Developing gratitude has been a life long journey, with an experience of it that has grown deeper over time. I am often reminded of the Joni Mitchell song “Big Yellow Taxi.” Its refrain is “Don’t it always seem to go that we don’t know what we’ve got til it’s gone….” For many of us, gratitude grows from an awareness of what we’ve lost, or what we stand to lose. For example, how much easier is it to appreciate good health after recovering from a serious accident or illness? Or to value electricity after a lengthy power outage? Or to feel gratitude for our remaining friends and family after one of them dies? Loss is not always a precursor to gratitude. It is possible to appreciate life’s gifts without it. For instance, think of how children squeal with glee when experiencing a winter snowfall (and the subsequent day off from school). Perhaps you can remember a trip to the beach and seeing the sunset across the water. Or you may be able to recall the excitement and anticipation of a new romance. However, learning gratitude through loss is an opportunity to deepen our understanding and appreciation of life from a new perspective. Shakti Gawain notes that it is difficult to get in touch with our gratitude when life is hard and we are going through a difficult time. However, with patience and perspective, these “healing crises” can provide meaning and purpose in our life’s journey. For instance, the sudden loss of someone dear to us can show us how “life turns on a dime” and remind us of the fragility and beauty of each moment we have. The unexpected loss of employment can force us to re-evaluate our career goals and options, perhaps leading us to a more rewarding or fulfilling work. Or a reduced level of income may force us to alter our lifestyle, finding a way to live more simply. We can, in the most difficult of times, learn to recognize – and appreciate — our greatest gifts and assets, as well as our “growing edges” – the lessons that we are be challenged to learn. In short, we can take these painful experiences and let them soften and expand our hearts, or harden and contract them. According to Julie Keene, minister and author, gratitude is closely connected to trust. “In order to be thankful for everyone and everything in my life, I need to trust that the Universe makes sense, that everything my soul has chosen to experience this lifetime has been for my ultimate Highest Good.” Once we are able to appreciate whatever life brings us, it is easier for us to then begin living in a place of contentment and gratitude. Our heart is able to find and dwell in a place of joy. As I consider what I have written so far, I must admit it looks deceptively simple, a bit like “A Guide to Enlightenment in three short paragraphs.” Finding and living in a place of gratitude is not instantaneous nor without some effort. But be assured, it brings immense rewards. There are more than a few reasons to incorporate more gratitude into our lives. Having an “attitude of gratitude” causes us to interact with others from a place of fullness. They are attracted by our energy and feel our appreciation. On the other hand, when our glass is “half empty,” we emit a negativity that tends to repel others and we experience less support. Cultivating gratitude has been linked to better health, sounder sleep, less anxiety and depression, higher long-term satisfaction with life and kinder behavior toward others. In a recent experiment at the University of Kentucky, students who turned in an essay were either praised for it or given harsh criticism. Then each student was allowed to play a computer game with the person who gave them the evaluation. The winner could administer a blast of white noise to the loser. Those who had received criticism about their essay retaliated against their opponent by giving an especially loud blast – much louder than those given by students receiving positive feedback. However, an interesting exception occurred among students who had been instructed to write their essays about gratitude. Even if their feedback was negative, they didn’t feel compelled to blast their opponents at a higher volume. 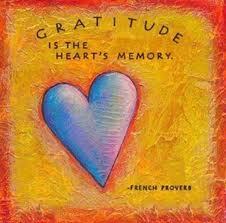 The researchers viewed the results as an indication that gratitude also reduces aggressive behavior. Gratitude grows best when it is cultivated. John Kralik, a California attorney and judge, has written about his experience of gratitude in a touching book, A Simple Act of Gratitude: How Learning to Say Thank You Changed My Life. He had reached a point in his life when he felt as if he had lost almost everything that mattered to him. His business was failing, his second marriage was ending, his living conditions were undesirable and he felt distance between himself and his two older children. He was angry and despairing and out of shape. On New Year’s Day he was struck by the thought that his life could be better if he could find a way to focus on the things he had, rather than those he had lost. He made a commitment to himself to write 365 thank you notes over the next year. The resulting story is an endearing and encouraging account of the personal changes he experienced in that process. Another way to begin a practice of gratitude is with what Robert Emmons of the University of California calls “gratitude lite.” It involves keeping a journal listing five things for which you feel grateful. The list is brief – only one sentence per item – and is done only once a week. The research he did with Michael McCullough of the University of Miami showed that after two months, there were significant changes among the journal keepers, compared with a control group. They felt more optimistic and happier. They reported fewer physical problems and spent more time working out. One suggestion for bringing more gratitude into your life is planning a “gratitude visit.” Psychologist Martin Seligman recommends writing a 300 word letter to someone who changed your life for the better. Be specific about what the person did and how it affected you. Then deliver it in person without telling the person in advance what the visit is about. When you get there, read the whole letter slowly and out loud to the other person. According to Seligman, if you do this, within a month you will feel happier. Other possibilities include keeping a gratitude calendar which emphasizes different blessings in each month; performing a service or volunteering to help someone; saying “thank you” often and with sincerity. The third time, truly take in that you are both here now, together in this precious moment. Kralik, John. A Simple Act of Gratitude: How Learning to Say Thank You Changed My Life. New York: Hyperion, 2011. Hay, Louise L. Gratitude: A Way of Life. New York: Hay House, 1996. Ryan, M.J. Attitudes of Gratitude: How to Give and Receive Joy Every Day of Your Life. San Francisco: Conari Press, 1999. A new wave of well researched and effective therapies has emerged in recent years. Examples include Eye Movement Desensitization Reprocessing (EMDR), Emotional Freedom Technique (EFT), Dialectical Behavior Therapy (DBT), Acceptance and Commitment Therapy (ACT), and others. This article will focus on the process and benefits of ACT, which primarily provides tools that can be applied to everyday life, with or without the help of an ACT therapist. The primary goal of Acceptance and Commitment Therapy, according to Dr. Russell Harris, is the attainment of “psychological flexibility.” This refers to an ability to be open to the present moment, a perhaps deceptively simple yet powerful concept. When we are psychologically flexible, we are able to feel and to observe what shows up in our lives, without clinging to it too tightly. If much our suffering results from how we respond to sadness, a depressed mood, anxiety or anger, then ACT provides the tools necessary to not worsen the situation by reacting to it or fighting with it. The result is greater self acceptance, less time focused on negative possibilities, and more time invested in valued action. 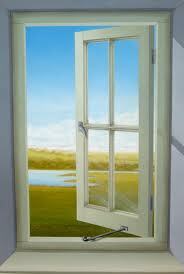 ACT often uses metaphors to convey its ideas, and a metaphor is helpful here. Suppose that a certain set of circumstances triggers a depressed reaction in me, and let’s say that this depressed reaction is like a branch that is floating down a stream. Any of the ways that I fight with this depression – whether by feeling badly about it, denying it or trying to avoid it by destructive means – are ways that I am damning up the stream that will not allow the branch to flow through. ACT provides the tools that will help keep me from doing this, so that I will be more able to watch the branch come, flow through and float by. Acceptance and Commitment Therapy falls under the broad category of Cognitive-Behavioral Therapy (CBT). However, it also follows a current trend in CBT to avoid counteracting symptoms, and to instead embrace the stance and practice of mindfulness. What are these tools? Acceptance and Commitment Therapy focuses on 6 core processes that work together. Each one requires effort, and will probably not be mastered over the course of a life time. The goal is to get better at them and experience more freedom, rather than perfection. Let’s look at each one individually. Defusion. This refers to an ability to watch and observe our thoughts and emotions, and to create a little distance between our selves and the thought or feeling. This step is not easy because we often tend not to be aware of our thoughts. With defusion, we slow down and observe ourselves having thoughts and feelings. Next, if appropriate and helpful, a step can be taken to see the thought as perhaps a part of me, but not attached to my deepest identity, and therefore capable of change. Acceptance. This refers to how I relate to the thoughts and feelings that show up in me. Am I mad at them? Do I hate them and wish they would go away? Do I treat them like unwanted guests? Or, conversely, do I welcome even the painful thoughts and feelings that show up in me, knowing they could have some useful information for me? Do I love these parts and treat them with compassion? Loving what shows up in us leads to relaxation and an ability to listen to ourselves. Contact With The Present Moment. To make contact with the present moment is to experience some sense of vitality right now. The requirements for this may shift as our moments shift. When we engage our observing self, we may pay attention to our sense of sight, smell, hearing, sound or touch, we may look inward and pay attention to our inner sensations, and we might do both of these at once. If we are dealing with a painful experience from our past, we will pay attention to our bodies and feeling experience, rather than ruminating over the facts of the past. Staying focused on the feeling sensations in our bodies allows us to be informed by them, as opposed to diverting our attention and missing out on the message they may offer us. Contact with the present moment often involves slowing down to be present with others, nature, and our own selves. Values. This refers to an ability to know what is important to me, and to allow myself to be guided and instructed by this knowledge. We are all given a certain amount of time on this earth to live in this life time. How do I want to spend it? What matters to me? What do I wish to leave behind? Getting in touch with my values both gives me a compass and a sense of deeper meaning. Committed Action. Once I know what my values are, what do I want to do to act on them? What possibilities am I willing to try out? How could my life take on more vitality by my action(s)? Acceptance and Commitment Therapy provides useful tools to stay open and present to the moment. There are times when using these tools may seem difficult, if not impossible. With practice, however, they can be useful in even the most difficult situations. ACT does not take the place of other types of important work that also help us be more present to our lives, such as grief work, trauma work, and understanding how our past experiences affect us. ACT can stand on its own as a useful and healing therapy, and can be used in powerful ways in conjunction with other types of therapies. I was delighted to see a recent article in a psychology journal that offers scientific evidence that being nice to ourselves is a more skillful way of dealing with our screw-ups than being hard on ourselves. Most of us fear that if we take the pressure off ourselves, we will screw up even worse. Not so, says this article. In fact, it is self-criticism actually increases the likelihood that you’ll screw up even more. Hard to believe? Read on. Self-compassion is a very old Buddhist idea which has only recently begun to be looked at from a research perspective. Kristin Neff, PhD, a professor of Human Development and Culture at the University of Texas at Austin, is one of the researchers exploring the area. After defining self-compassion from an academic perspective, she developed a scale to measure it and many researchers have used that scale in subsequent studies. By far most of the findings support the idea that self-compassion is linked to a number of positive mental health outcomes, including increased happiness, optimism and social connectedness. People who score high on self-compassion also tend to suffer less from anxiety, depression, rumination and fear of failure. Dr. Neff has also developed a training program to teach people to practice self-compassion. She suggests starting on paper. For example, say you’re upset that you made a big mistake at work. What would your most supportive friend say about the experience? Write down everything this friend might say to you, from his or her point of view. Then read the letter back to yourself — and try to take the words to heart. To get more exercises for increasing self-compassion, you can go to You Tube and search under Kristin Neff. She has a variety of training videos available. What are the downsides of self-compassion? None have been found so far — and not for lack of trying. Initially another researcher, Mark Leary, Ph.D. suspected as I did that self-compassion might be linked to self-indulgence. If you’re too nice to yourself, he theorized, you can let yourself off the hook no matter what you’ve done wrong. To his surprise, he found just the opposite. People high in self-compassion take more responsibility for the bad things that happen to them than those who do not have high self compassion. One reason low-compassion people might deny responsibility for bad things is that they have a mistaken sense of responsibility – they expect too much of themselves and then feel horribly bad if they’re not perfect. People high in self-compassion, however, can admit their mistakes without all that self-flagellation. Information in the above article was taken from the Monitor of Psychology, published by the American Psychological Association, Vol. 42, No. 7, July 2011, p. 42. Science Watch: “Golden Rule Redux” by Kristen Weir. Fain, Jean, Ph.D. (2010) The Self-Compassion Diet. Gilbert, Paul, PhD, (2009) The Compassionate Mind. Leary, Mary, Ph.D. (2007) Journal of Personality and Social Psychology (Vol. 92, No. 5). Leary, Mark, Ph.D.(2007) The Curse of the Self: Self-Awareness, Egotism, and the Quality of Human Life. Neff, Kristin, Ph.D. Self-Compassion: Stop Beating Yourself Up and Leave Insecurity Behind” (2011). Neff, Kristin, Ph.D. (2009) Human Development (Vol. 52, No. 4).